“Halloween Horror Nights” begins on Friday, September 16, 2016. With the addition of the first-ever female dancer to the popular dance crew, the Jabbawockeez will take to the stage within the Special Effects Show venue donning their signature white masks. The diverse group of dancers will perform a repertoire of innovative, synchronized choreography accompanied by a stunning laser lights display that will come to life in a full spectrum of color. The all-new, high-energy Jabbawockeez show, created exclusively for “Halloween Horror Nights,” will once again underscore the dance crew’s unique brand of humor as they transport guests into a new realm of gravity-defying dance, elevated to new heights by special effects and pulse-pounding music. “Halloween Horror Nights” at Universal Studios Hollywood brings together the sickest minds in horror to immerse guests in a living, breathing, three-dimensional world of terror. Featuring an all-new slate of unrivaled film production quality mazes, frightful scare zones and a fully re-imagined “Terror Tram” experience uniquely themed to today’s most definitive horror properties, “Halloween Horror Nights” will taunt, terrorize and torment guests with spine-chilling haunted attractions as part of Southern California’s most extreme Halloween experience. “Halloween Horror Nights” 2016 mazes include “American Horror Story,” that will unlock the terror from three installments of FX Networks’ wickedly gruesome TV series; “The Exorcist: The Possession of Regan MacNeil,” based on the iconic supernatural horror film; “Freddy vs. Jason,” inspired by New Line Cinema’s 2003 film that brought together the biggest horror icons in history:demented killer Freddy Krueger (A Nightmare on Elm Street) and notorious hockey mask killer Jason Voorhees (Friday the 13th); “The Texas Chainsaw Massacre: Blood Brothers,” which pitsguests against the unsavory wrath of manic killer Leatherface and his mentally unhinged brother, ChopTop; “Halloween: Hell Comes to Haddonfield,” an all-new maze inspired by the second film in the classic “Halloween” horror franchise; and “Krampus: The Christmas Devil,” based on Legendary Pictures and Universal Pictures’ Christmas-themed horror film that brings to life the fabled anthropomorphic “half-goat, half-demon” horned creature who terrorizes those devoid of holiday spirit; and “The Walking Dead,” an authentic living representation of AMC’s hit television series that takes the realism of the show to an entirely new level with the all-new permanent attraction. 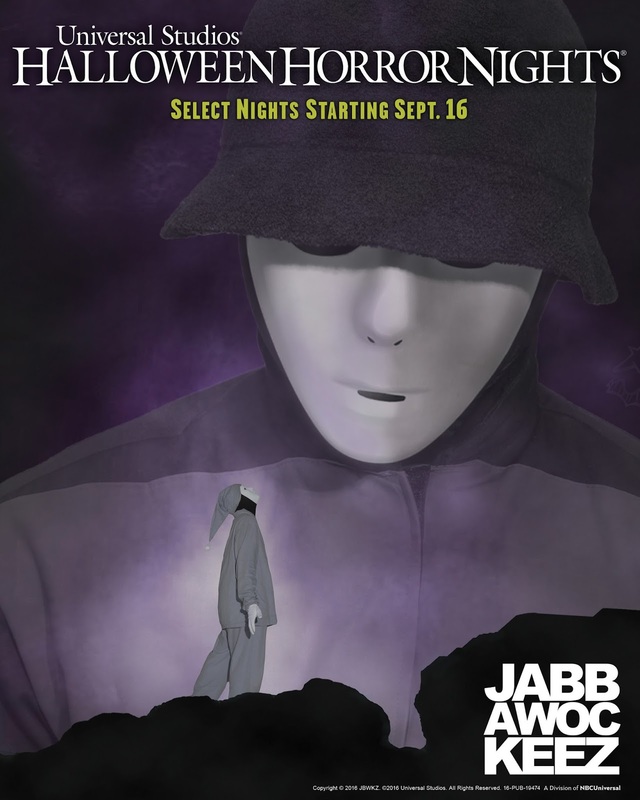 To learn more about the all new Jabbawockeez show at “Halloween Horror Nights,” click here. Universal Studios Hollywood is The Entertainment Capital of L.A. and includes a full-day, movie-based theme park and Studio Tour. As a leading global entertainment destination, Universal Studios Hollywood delivers highly themed immersive lands that translate to real-life interpretations of iconic movie and television shows. Recent additions include “The Wizarding World of Harry Potter TM” which features a bustling Hogsmeade village and such critically-acclaimed rides as “Harry Potter and the Forbidden Journey” and “Flight of the Hippogriff™,” Universal Studios Hollywood’s first outdoor rollercoaster. Other immersive lands include “Despicable Me Minion Mayhem” and “Super Silly Fun Land” as well as “Springfield,” hometown of America’s favorite TV family, located adjacent to the award-winning “The Simpsons Ride™.” and the all-new “The Walking Dead” permanent daytime attraction. The world-renowned Studio Tour is Universal Studios Hollywood’s signature attraction, inviting guests behind-the-scenes of the world’s biggest and busiest movie and television studio where they can also experience such authentic and immersive thrill rides as “Fast & Furious—Supercharged.” The destination also features the Universal CityWalk entertainment, shopping and dining complex, including the Universal CityWalk Cinemas and the “5 Towers” state-of-the-art outdoor concert venue.